Harissa, a North-African spice blend, uses both mild and spicy peppers to strike the perfect between hot, smoky, and sweet. 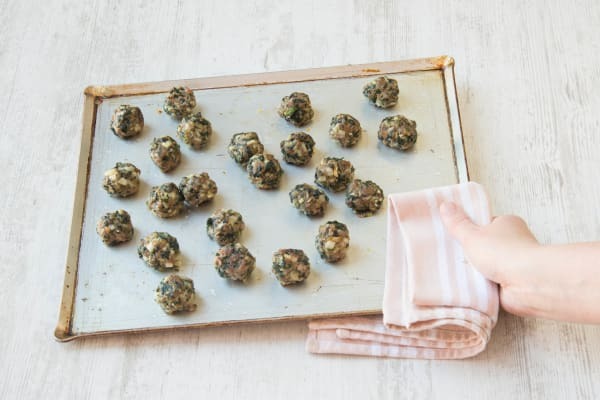 We’re mixing it into these fragrant meatballs along with mint, oregano, and the secret ingredient—cooked spinach! It’s a great way to sneak more veggies into dinnertime, especially for picky eaters! Preheat oven 400 degrees (200c). Halve, peel, and finely dice the onion. Mince or grate the garlic. Mince the oregano and mint. Halve the lemon. Using a vegetable peeler, shave the zucchini into ribbons lengthwise, rotating as necessary. Discard the seedy core. Bring 1 cup water and the stock concentrate to a boil in a small pot. Toss the zucchini ribbons in a bowl with the juice of one lemon half. Season with salt and pepper. Once the water is boiling, add the bulgur, cover, and reduce to a simmer for 12 minutes, until tender. Keep covered until the rest of the meal is ready. Meanwhile, heat ½ tablespoon olive oil in a large pan over medium heat. Add ½ the spinach to the pan and cook, tossing, 2-3 minutes, wilted. Season with salt and pepper. Let spinach cool slightly, then finely chop. 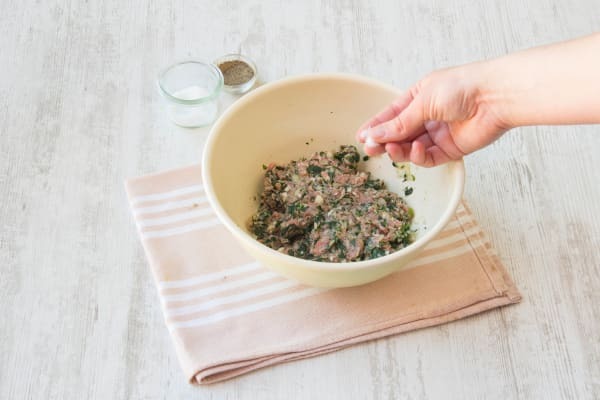 In a medium bowl, combine the ground lamb, cooked spinach, panko, onion, oregano, half the garlic, half the mint, 1 teaspoon harissa (or less to taste, it’s spicy! ), and a large pinch of salt and pepper. Form lamb mixture into 1-inch meatballs and place on a lightly oiled baking sheet. Place in the oven for 10-12 minutes, until cooked through. 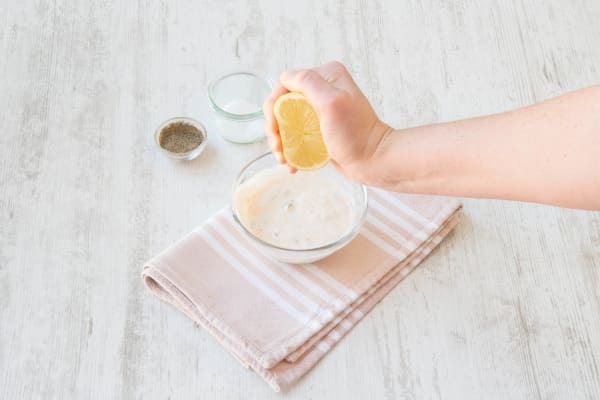 Meanwhile, make the spiced yogurt sauce: in a small bowl, mix together the yogurt, remaining mint, remaining garlic, harissa (to taste), and a squeeze of lemon. Season with salt and pepper. Toss the marinated zucchini ribbons in a large bowl with the remaining spinach, a squeeze of lemon, and 1 tablespoons olive oil. Season with salt and pepper. 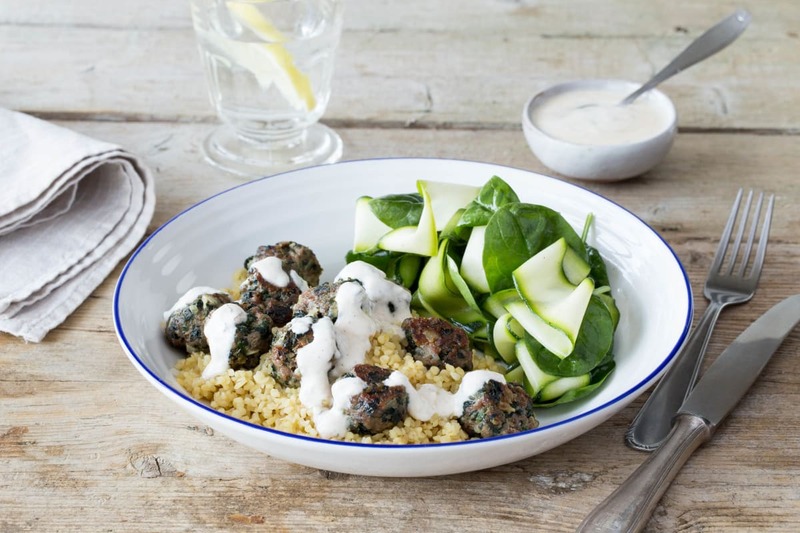 Serve the meatballs atop the bulgur, drizzled with spiced yogurt sauce. Plate the spinach and zucchini salad to the side. Enjoy!